← Summer? Where Did it Go? Now – onto our summer adventures! One of the best things about blogging Lola Pug’s adventures is that we get to meet some really fantastic people from all over the world. We have already become real-life friends with Winston and his people, and now we can add the wonderful Christy and Tim – Angel Pug Payton‘s people – to that list. Okay. So Lola wasn’t too impressed, but her indifference merely cemented our suspicions that Lola and Payton were, indeed, soul sisters. And Christy and Tim are as lovely in real life as they are online. I had to get a photo of Christy’s uber-sweet tribute to Pugnacious P.
Needless to say, the pugs weren’t overly impressed by our standing around and endlessly gabbing away. By the end of our visit that day, Lola was tired, so I asked if she could share a ride with Winston in his stroller. …and the concern was clearly all for naught. 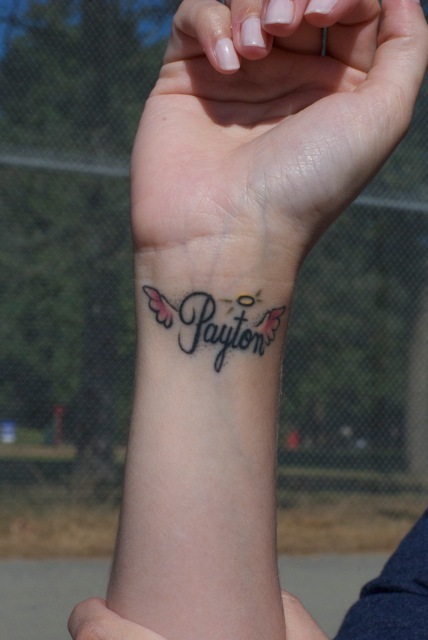 We left our meet up with full hearts, and a little gift from Payton… but that is a whole other post unto itself…. OMD! Those two are the CUTEST EVER!!!! Ma keeps laughin’ and sayin’ ‘Awwww’. So precious. Looks like there was a good time all around! What a good way to end the summer, huh? 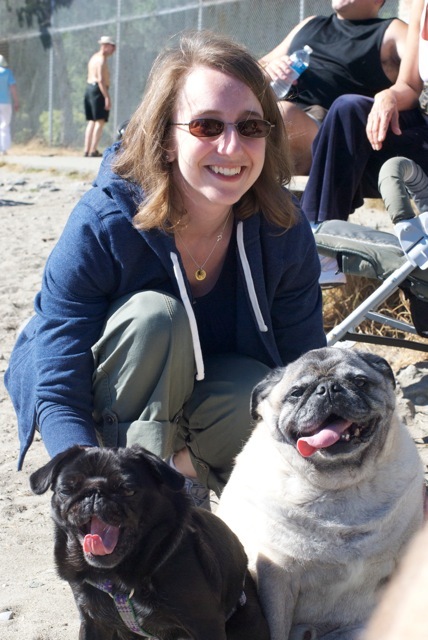 Oh the pic of Christy with the pugs! Too cute! 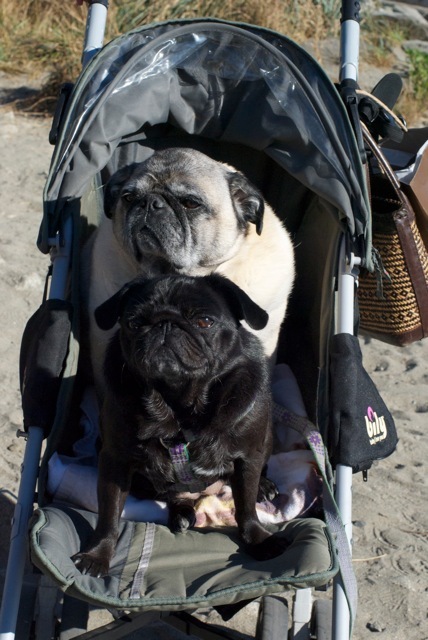 And Lola and Winston in the stroller! Too much! So glad you all got to meet! I should introduce my Lappies to Lola when you’re back in the MTL. 😉 Even if they aren’t Pugs. Sophie can be all stand-off-ish and have a Diva-off with HRM. Hehehehe! Love the stroller sharing! Great to have friends. Christy and Tim are awesome, so glad you were able to meet them. We can’t wait to see them again in October. Totally impressed with Lola and Winston in the stroller. Lola must have realized that the ride was worth any near pug contact. Adorable you two in the stroller!! !